I love clothes. I know it is very materialistic of me to say but something about bringing home a fresh new piece makes me smile big! Sadly clothes can be expensive and I do not like to pay full price for anything. Really, I do not pay full price. Ever. So I wanted to start a series to share some of my deals with you. Each week I will share an item and the details of where I got it and how much I paid. Make sure you enter your email address on the right so you can follow along! 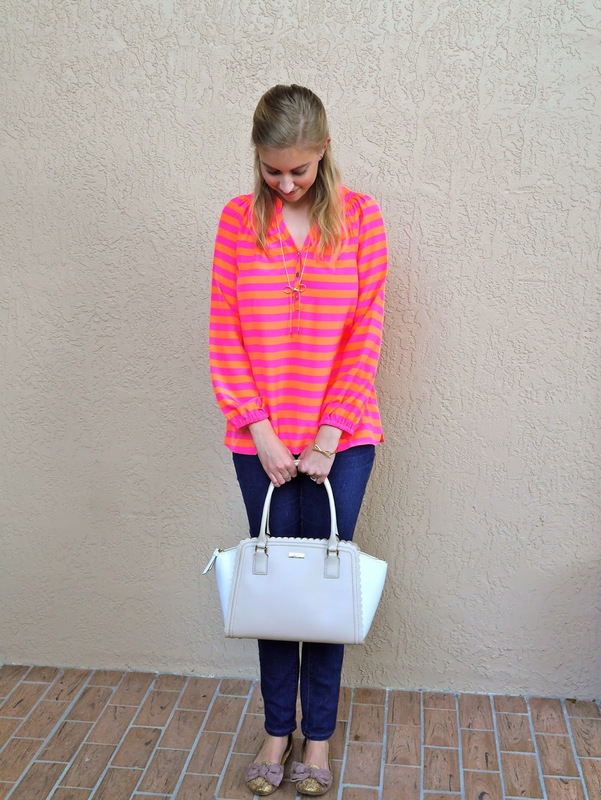 This first post is kind of a two-for-one: Lilly Pulitzer Elsa and Kate Spade Purse. First is this gorgeous bag! I got it a while ago, this past summer. It is from the Kate Spade outlet and I got it when they were having a big sale - I think 50% off plus an additional 20% off. I believe I paid $142 for it, something like that. I bought it as a reward for myself for completing my internship! Plus I couldn't resist the scallops! I should have taken a picture of the inside too - the lining has little black bows on it! Next comes my first Lilly Pulitzer Elsa top! If you haven't heard of these they are a staple Lilly item and are 100% silk. They retail for around $158 depending on the print. 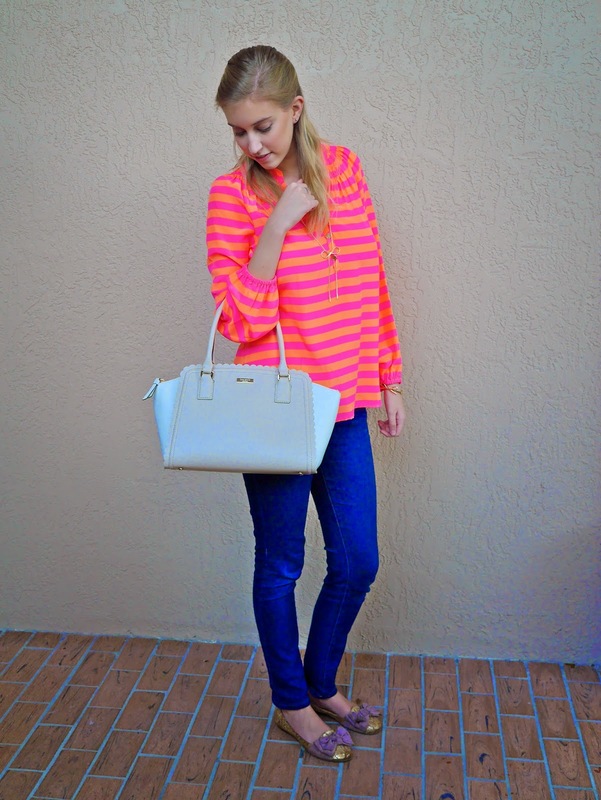 Well I found this site called Twice and it is a company where women can buy and sell gently used clothes and handbags. They only accept certain brands and everything has to be in great condition. Okay finally gonna spill the beans here: I paid just $22.50 for this top! I was so excited because I have been wanting one for so long and I finally found one at a price I was willing to pay! The top was listed for $44.95, still a good deal when you consider the retail value, but for my first purchase they gave me 50% off everything! I found Twice through an ad on Facebook actually and I was pleasantly surprised! You can sign up here and get a $10 credit to use! If you're looking to sell you can get an additional $10 by using that link as well. I purchased a few other (great) things too, but I'm saving those to share later! Sign up for emails so you don't miss out - hint: more Lilly deals to come! Don't you just love finding deals like that?? 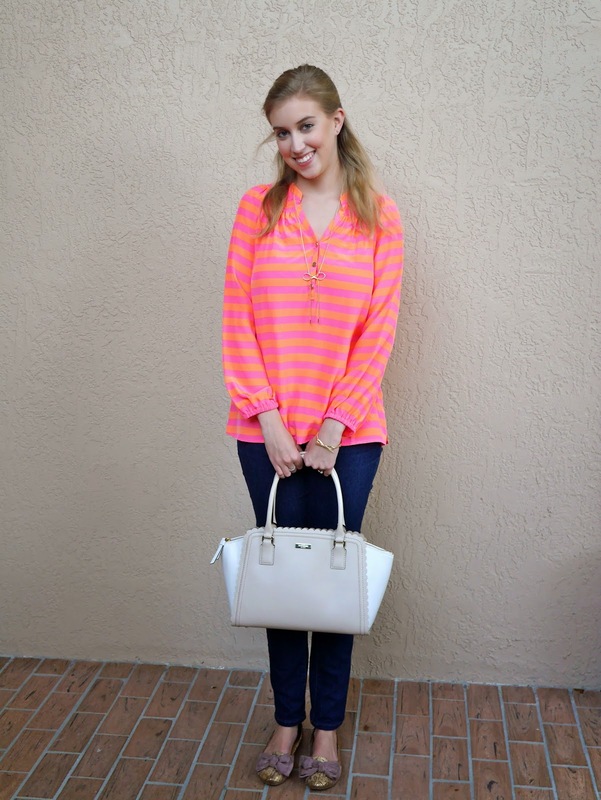 I LOVE the shape and color of your Kate Spade. *SWOON! * Also, I see that you are a Florida gal! So am I! Born and raised, but living in NY until next summer when I will hopefully be back in the Sunshine State!